The 2018 Urban Light Ministries Strategic Plan reviews the organization’s history and strengths and identifies opportunities to develop a vision and direction enabling the organization to expand its achievement in fatherhood awareness, education, and improving families. Urban Light Ministries is a 501(c)3 non-profit organization that was established over 25 years ago with the mission of increasing the number of responsible fathers, nurtured children and strong families in Jesus’ name. The primary programs offered by the organization include community-based fatherhood programs such “Nurturing Father’s for Life” (NFL) and elementary student ministries – Sonshine Clubs. The work of the organization is currently community-based in the Springfield, Ohio, and greater Clark County area. Urban Light Ministries has over 25 years of experience in developing and implementing programs that meet the needs of fathers and children. 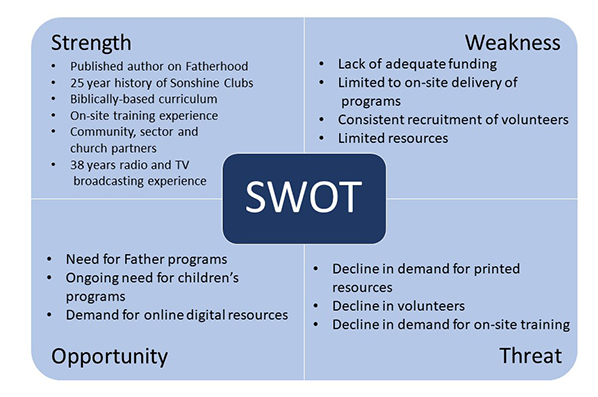 A SWOT analysis has determined ways to use the strengths built over the years to address the new opportunities associated with reaching the target audiences. The analysis revealed the need for fatherhood programs addressing the absence of fathers in the family and training fathers to be better role models is more critical now than it was when Urban Light Ministries began. One of the newest opportunities is the use of digital media to reach the target audience. Technology, through online training, smartphone apps, and social media awareness, has opened the channels for communicating with this market. Urban Light Ministries strengths in program development and broadcasting positions it to use the latest technology to enhance its program reach. This change to move more communications through these new online channels will better leverage the resources (financial and people) to reach a larger audience. Weaknesses, including lack of funding and volunteers, can be minimized through better leveraging current resources and proving to potential funders an improved program impacting more fathers and families. Strategy 1.1 – Bring all current fatherhood programs and resources under one brand name (TBD) leveraging the “Father Love” program and book developed by Rev. Eli Williams and use as a platform for all future Fatherhood programs. Build the curriculum and study guide for online training execution and integrate the other Fatherhood Program curriculums into one cohesive deliverable. Strategy 1.2 – Build a network of fathers and father figures for mutual support, skill building, and family strengthening through providing a Fatherhood Toolkit using an online community, social media and blogging to improve the awareness and importance of fatherhood issues and teachings. Strategy 1.3 – Develop and implement the Fatherhood Toolkit through a Church-based video group learning program to foster action by local church congregations within their own communities. Strategy 1.4 – Continue working and building partnerships with local outreach programs that connect with fathers and new mothers to continue building strong curriculums, outreach programs and resources. Strategy 2.1 – Leverage the Sonshine Club program curriculum and publish a marketable curriculum that can be sold to churches and other school systems. Strategy 2.3 – Develop a smartphone app game for elementary students that incorporates the Biblical teachings and education through storytelling and active decision making. Show outcomes of good and bad decisions. Strategy 2.4 – Leverage Sonshine Club program curriculum and build “self-help” materials and videos for children seeking support and mentoring. A “Fatherless Hotline” to support fatherless children, new mothers and fathers seeking assistance. Objective 3: Build organization and facilities to expand local support to over 1000 families. Strategy 3.1: Develop a capital funding plan to provide a new facility as a major resource center and focused on helping fathers get back on their feet. Provide services such as job placement, legal assistance, mentoring, free wi-fi and computer use for job search, and new business research.